One of the reasons we chose to visit Vietnam so early on in our full-time travel adventure is that a boat cruise in Halong Bay has been on our bucket list for a long time. Our overall plan is to travel on a fairly moderate if strictly-kept budget. However, for the first week we were away we decided to splurge as if we were on a normal holiday. Therefore, a multi-day Halong Bay cruise was our chosen option. This is the TripGourmets Halong Bay cruise review, based on our own experience. This post is part of our Vietnam 3 Week Itinerary post. Click here to see the whole Vietnam 3 Week Itinerary. Please note that this is not a sponsored or paid post. All views and opinions shared in our Halong Bay cruise review are our own. However, this post does contain affiliate links. If you use these links to make a purchase then we may receive a small commission from the vendor – at no additional costs to you. Quite simply, because it is one of the most stunningly beautiful places in the entire world. Halong Bay is an area off the coast of Northern Vietnam, about 3 hours drive from the capital, Hanoi. The bay itself is around 1500 square kilometres of water. It features somewhere around 2000 limestone islets, or karsts, of varying sizes, that jut randomly out of the water. These karsts are a geological marvel, formed over the last 20 million years. Many are hollow or contain their own lagoons. Floating through this stunning natural beauty for hours at a time feels like a different world. Local legends abound about how the area came to be created. The most popular one is that the gods sent dragons to Vietnam to protect from invaders. In fact, the name Ha Long in Vietnamese literally translates as “descending dragon”. Even within the caves and islands, there is much local folklore and history to be discovered. The entire area has twice been designated as a UNESCO World Heritage site, once for its natural beauty and again for its geological value. It is also featured as one of the New 7 Wonders of the Natural World. 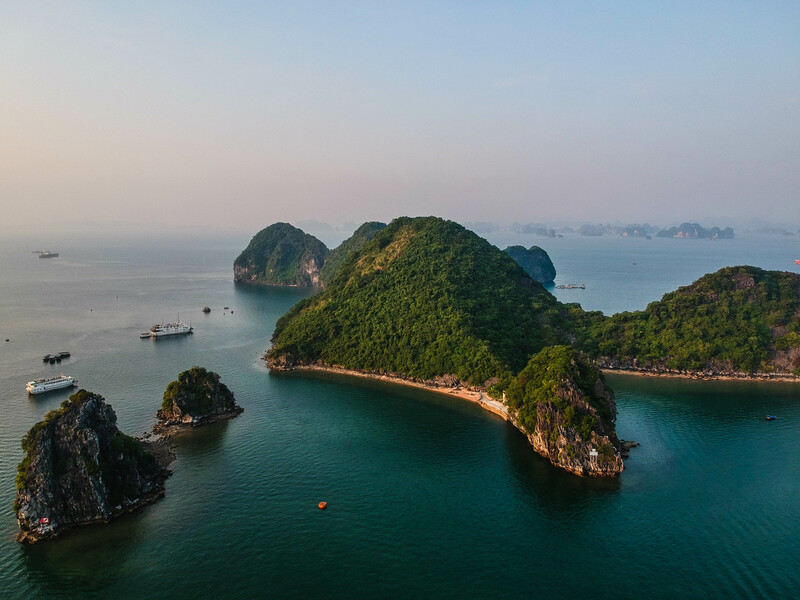 Due to the increasing levels of tourism impacting on the environment, the Vietnamese government has taken measures to limit the areas that can be visited by tourists. Therefore, the only way to really see Halong Bay these days is to get into a tour. There are a number of designated sites and routes that can be discovered via a tour. Those not covered by the tours are generally closed to visitors as an environmental protection measure. You will want to visit Halong Bay because it is beautiful and magical. Everyone else wants to visit Halong Bay because it is beautiful and magical. This place is one of the most – if not THE most – heavily touristed in Vietnam. You will not be alone, there will be a lot of other tourists. Accept it and just enjoy your trip. But can’t I travel there independently and avoid the crowds? In a word, no. What will happen is that you will end up trying to find a boat in Halong City, and you will most likely get ripped off by a tour company selling overpriced trips, just so you can get on a boat. Do like we did and book in advance. You can do this either online or via a tour company in Hanoi. Don’t believe us? Our friends Ivana and Gianni over at Nomad is Beautiful have been travelling far longer than us and are massive fans of independent travel. They can tell you that how to travel to Halong Bay is via a tour company. This Halong Bay cruise review is obviously based on our own experience. We browsed for hours and eventually chose the four-star Carina cruise. We chose the Carina cruise because we wanted a small boat for a more intimate experience with the area and less noise from other tourists. Their website tells of their support for responsible and sustainable tourism, whilst maintaining a level of comfort and luxury that we wanted from the “holiday” part of our trip. It also has excellent online reviews, bearing in mind the plethora of Halong Bay cruises and reviews available to browse online. The Carina cruise offers options for a 2 day/1 night cruise or a 3 day/2 night cruise. We wanted to get the maximum out of our visit, so we opted for the 2-night version. Carina cruise offers pickup and drop-off from hotels located in the Old Quarter of Hanoi. Halong Bay is about a 3-4 hour drive away. We met the bus without any issue and were soon on our way. Our tour guide introduced himself as Brian. He explained that this is obviously not his real name, however as Vietnamese is a tonal language, his real name is difficult for Westerners to pronounce and a mispronunciation results in something that sounds rude in Vietnamese! So, Brian, it was. He gave a very entertaining commentary on Hanoi and our upcoming itinerary for about the first 30-40 minutes of the journey. Of course, you can organise the transport from Hanoi to Halong Bay also individually and then book a cruise once you’re there. Check out this transfer option in a Super Limousine Bus! All the tour buses stop at the Hong Ngoc shopping centre, about halfway through the trip. Although it is literally packed with tourists due to being a common stopping point, they have clean and free-to-use bathrooms. The vast shop is also a local social initiative to provide training and employment to people with disabilities. It sells all manner of local products from small souvenirs to clothing to vast pictures and ornaments. Arriving at Halong City for the boat pickup can be a little intimidating. Brian told us that there are 400 day-boats and 200 boats with cabins on the entire bay. The smallest are honeymoon boats with only one cabin, the biggest are tour boats with up to 50 cabins. Most are in between with the Carina being one of the smaller vessels. However, so many boats and tourists embarking and disembarking does feel a bit like a circus. Piccadilly Circus, to be precise. However, we only had to wait around 5-10 minutes and the boat was ready for us. We were loaded onto a smaller boat and whisked with military efficiency across the harbour to the Carina. Together with our 12 fellow passengers and luggage. Once on board, we were given a refreshing welcome juice cocktail drink. We sat in the main dining area on the middle deck for our briefing. The dining area is where all the meals are served, and has a small but well-stocked bar. Aside from water and the beverages which are flagged as complementary, all drinks on board are charged. Typical price is around VND50,000 ($2.20) for a beer, with spirits and cocktails being a little more expensive. Brian explained our Halong Bay itinerary for the rest of day 1, and we were shown to our cabins. Based on the cabins alone, this Halong Bay cruise review gives a big round of applause. I mean, what more do you need for two nights, right? We had lunch (more on the food later) and then started our Halong Bay adventures. The smaller boat took us out to Luon Cave. When I think of a cave, I think of a cavern. However, Luon cave is accessed only via boat through a short tunnel. We were offered the opportunity to kayak or to be rowed on a bamboo boat by a local person. We chose the kayaks so we could explore ourselves. When we emerged from the tunnel, we were in a vast open lagoon that is enclosed all around by cliffs covered in vegetation. Because there are no motor boats, only oars from the kayaks and bamboo boats, everything is peaceful and tranquil. There are monkeys playing down near the water on one side, and as we rowed around we marvelled at the astounding natural beauty of it all. You want to take some valuables with you but are afraid they could get wet? Then check out our post about the best waterproof bags for keeping your travel gear dry! Even if you haven’t kayaked before, we can recommend this as a place to try it if you are a reasonably active and able-bodied person. The kayaks are 2-person vessels, and they are easy to move around and steer with a bit of practice. We stayed for about 45 minutes and then got back on the boat to Titop Island. On this island, we climbed up around 400 steps to the top to see the stunning late afternoon views over the bay. There is also a sandy beach that offers one of the few safe swimming opportunities in the bay (jellyfish stings being the main risk elsewhere). The island itself is named after the Russian cosmonaut Gherman Stepanovich Titov who visited the island with President Ho Chi Minh in 1962. He wrote a message in the visitors’ book expressing his thanks and amazement at the island and the hospitality of the Vietnamese people. Upon our return to the “mother ship” we had some quiet time in our cabins and then an evening party on the open top deck with the other passengers. We were offered local wine and fresh fruits, and then dinner, which all went down very well! After dinner, there was a chance to relax and socialise with the rest of the group. We also tried fishing for squid over the side of the boat. So far, our Halong Bay cruise review had some fantastic experiences to share. Although we chose not to partake as we are not morning people, a pre-breakfast activity of Tai Chi was offered on the top deck from 0630 onwards. A quick word about the breakfast aboard the Carina cruise. Breakfast offers options of Vietnamese or Western style. The Vietnamese choice is pho soup with beef. If you prefer a western-style breakfast, then there are multiple options including omelette, scrambled eggs, bacon, yoghurt, toast and fresh fruit. Tea and coffee are free, however, fresh juices are a paid option. We found breakfast on board the Carina to be of high quality, with the chef cooking the hot food in the dining area itself. After breakfast, we boarded the small transfer boat that was to take us to the day boat. The day boat was really just a smaller version of the main boat, with no cabins but a spacious dining area with lots of windows. Our day host introduced himself as Nam – another friendly and humorous host with very good English. The reason for moving to a day boat is logistical – our cruise was comprised of passengers doing both 2 and 3 days cruises. On the second day, the mother vessel takes the 2-day passengers back to shore and picks up a bunch more 2-day cruise passengers. So if you book a 2-day cruise, you will enjoy days 1 and 3 itineraries from this Halong Bay cruise review. I suspect many of the companies use similar logic. Do you have only time for a one day cruise of the Halong Bay? Then check out this amazing one day tour which starts and ends in Hanoi! We sailed on the day boat for around an hour across the bay until we came to Cua Van floating village. This is an actual working fishing village comprising around 700 residents. We kayaked around the various floating platforms. The buildings are remarkably well-maintained, with local people visibly going about their normal day – casting, hauling and maintaining fishing nets. Dogs barked at our kayaks from the edges of the floating gardens. We had been warned not to go too close as the dogs might try and jump aboard the kayaks for a ride! Can you imagine that people live here? In case you may be wondering, the floating village is not a tourist trap. It is a genuine home to the residents there and we kayaked around without anyone trying to sell us tourist trinkets. Although, if we had wanted to buy a drink or a souvenir, there was a small stand next to the landing spot. After we left the floating village, we sailed for another hour or so during which time we also ate a delicious multi-course lunch. During the lunch, we drew close to the pearl farm, where we could see hundreds of lines of what looked like small buoys, where the pearl oysters are grown. At the Pearl Farm, we learned a ton of information about the delicacy and precision involved in growing these precious gems over many years. Cultured pearls are made when a small amount of mantle from another oyster is inserted as a graft into the reproductive organs of a healthy pearl oyster. This stimulates the production of something called nacre, a chemical compound that hardens in layers over time to form the pearl oyster. We watched one of the grafting technicians at work and it was clear to see that this is a job that only highly trained technicians can perform if the best pearls are to be grown. Even if the grafting process is undertaken correctly, and all other conditions are optimised, there is only around a 50% chance that a saleable gem will be obtained at the end. It takes around 5 years between grafting and harvesting, during which time the oysters must remain alive and healthy. Pearls for sale are categorised according to colour and size. Those that are not suitable for sale can be used in e.g. cosmetics. At the end of the tour, there is an opportunity to buy from a wide range of pearl jewellery. Can you spot the pearl? As the last activity of day 2, we went to Me Cung Cave, also known as Maze Cave because of its series of interconnected caverns inside. Filled with stalactites and stalagmites within the passage, the most alluring feature for us is when it opens out on to the amazingly blue Me Cung lake. At 25m above sea level, there are also yet more wonderful views out over Halong Bay. At the end of day 2, we had some quiet time aboard the main ship before dinner. We used this time to fly our drone and see the breathtaking surroundings from above. Check our post about the best drones for travel if you’re playing with the thought of getting a drone yourself! During the evening of day 2, the chef came to the main dining area to perform quite a show of a flaming pan, into which he threw the giant shrimps. After adding some herbs, chilli and citrus juices, he doused the entire thing with a cup of water to great sizzling effect and within seconds, ta-da! Cooked steamed giant shrimps. Peeled with our own hands at the table a couple of minutes later, they were deliciously fresh. The only complaint we had about the food on the Carina cruise is that there was more than we could eat at every single meal – not necessarily a bad thing if you have a huge appetite! Do you want to try some more of the delicious Vietnamese food? Then let you inspire by our Ultimate guide to food in Hanoi Old Quarter! Day 3 of our Halong Bay cruise dawned bright and sunny. After breakfast, we boarded the small boat for our last excursion of the trip. Hang Sung Sot, or Surprising Cave, was actually first named so by the French. It is accessible via a set of stone steps, that take you to the entrance. The cave seems small at first, however, on passing through the first few chambers, it opens up into the most enormous cavern. The path seems deliberately designed to keep surprising you with new openings at every turn, making the cave seem even bigger each time. Although Surprising cave was perhaps the most spectacular of the excursions we did during our Halong Bay cruise, it was also without a doubt the most crowded. Walking into the cave during the initial part feels like you are part of a gigantic herd, and we found it really unpleasant. However, once the cave opens up to the final enormous cavern, the crowds do thin out and it becomes more pleasant. Nevertheless, the Bay authorities would do well to limit the number of visitors allowed at one time to ensure a more pleasant experience for all. After arriving back at the main boat again around 0930, we had a short while to pack up our cabins. This was much appreciated as otherwise, it made for a very early start before breakfast. The last activity takes place on the boat and is a short cooking demonstration. In the main dining area, the chef prepared some filling for spring rolls. This would be one of the courses we would have for lunch a short while later. He showed us how to roll the filling into rice paper, and we were all allowed to make our own spring rolls using the pre-prepared filling. It was great to learn how one of the dishes we enjoyed was prepared. After a final big lunch, we arrived back at the harbour for our bus transfer to Hanoi. Although it is an extremely “touristy” experience, a cruise of Halong Bay is something we enjoyed immensely and can recommend to anyone. Yes, you have to put up with being in close proximity of lots of other tourists, especially during the Surprising Cave excursion. Our Halong Bay cruise review has tried to reflect this in an honest way. However, seeing this astounding display of natural beauty up close is something unmissable for any visitor to Vietnam. Just sit back, filter out everything you don’t want to see, and enjoy the experience of being in one of the seven natural wonders of the whole world. Do you want to experience the Halong Bay in a more unique way? Then check out this breathtaking Seaplane and Overnight Junk Boat Cruise! If you would like to book this specific cruise, then we would love you to use our link which will bring no extra costs to you. Otherwise, you can browse all the hotels and cruises in Halong Bay below. If you want to read more about what we did during our month-long stay in Vietnam, then also check out our post about Hoi An Lantern Festival. What an amazing experience. A 3 day cruise seems like the perfect way to have a great variety of experiences in Halong Bay. I had never heard about this before but it will definitely go on the list for a Vietnam visit. I am so glad you are sharing your adventures in detail as you travel ! Hi Linda, thank you very much for your comment! The cruise was absolutely awesome, but … 3 days is enough. After those three days we were glad to have a proper place to retreat again 😀 We can absolutely recommend do go and visit the Halong Bay when you’re in Vietnam. It’s kind of a once in a lifetime adventure. I couldn’t agree more, pre-booking a tour is definitely the best way to go, I did the same when I was there although your tour I have to say does look & sound fantastic! I love all of your pictures guys, the light is incredible, you are really making me want to visit Halong Bay again! Hi Kelly, thank you very much for your lovely comment 🙂 When we were at the actual harbour, we saw some cheaper boats as well, but I guess you can go a lot cheeper if you don’t mind having no safety on board.We really enjoyed the trip and yes, the weather was just fantastic! Thank you so much Gloria, we’re glad that you like it. Those three days were some of the most wonderful in our lives and we wanted to show that as well. Thank you for following our blog and our travels.